Snickerpoodles & Duke’s 1st Birthday! Just last week, our sweet little boy celebrated his first birthday. And if you saw his birthday portrait that I posted on Instagram, you’re probably thinking, “He’s not so ‘little’ anymore!” We’ve enjoyed this year of firsts and are blessed with his adorable smiles, loving personality and eagerness to learn. He really is a wonderful dog and I can’t imagine our lives without him! 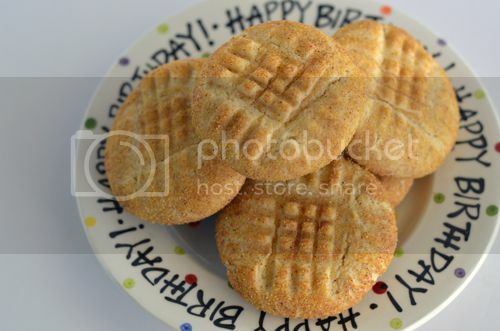 I had planned on baking up a batch of the Apple & Cheddar Pupcakes that I had made for Kacy’s first birthday a few years ago, but I wanted to do something different for Duke. So when I saw a recipe for Snickerpoodles, I knew that was it. As you can see, Duke absolutely loved them. And the ones that I sent home for his brother Rusty and cousins Kacy, Kash, Dixie & Gracie were devoured in mere minutes. 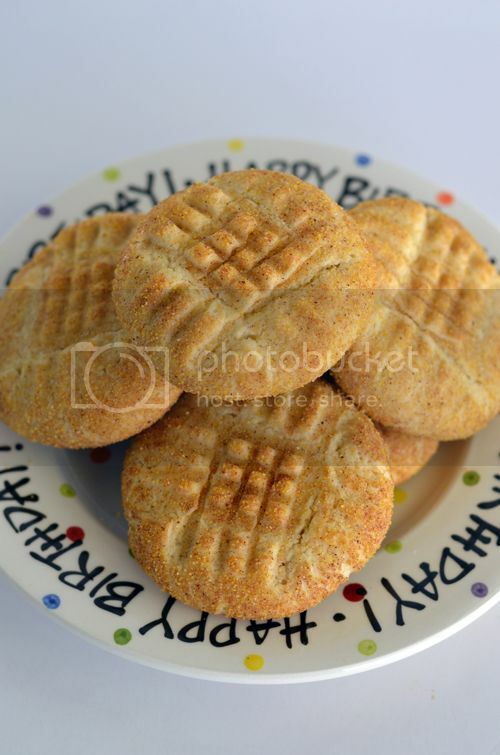 They’re really easy to prepare and keep well in an airtight container… IF you can keep any around long enough! Preheat oven to 400 degrees F. Cream vegetable oil, butter and honey together until smooth. Add eggs and beat well. Blend in flour, baking soda and cream of tartar, kneading dough until mixed well. Shape dough by rounded tablespoons into balls. In a small bowl, whisk together the cornmeal and cinnamon and roll balls in mixture. Place 2 inches apart on a baking sheet lined with parchment paper. Press the balls down with a fork twice going in 2 different directions or press with your favorite stamp. Bake approximately 8 minutes, then remove from baking sheet and cool completely on a rack. Happy Birthday little man… now it’s on to your Terrible Twos! 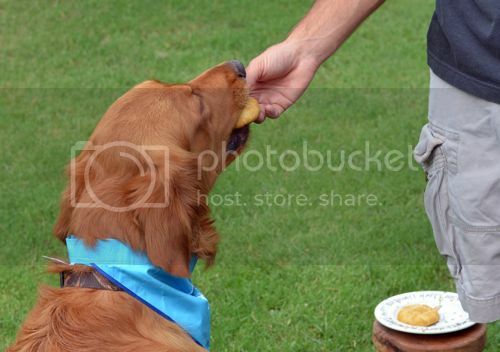 Yum on those cookies, and happy birthday, Duke! 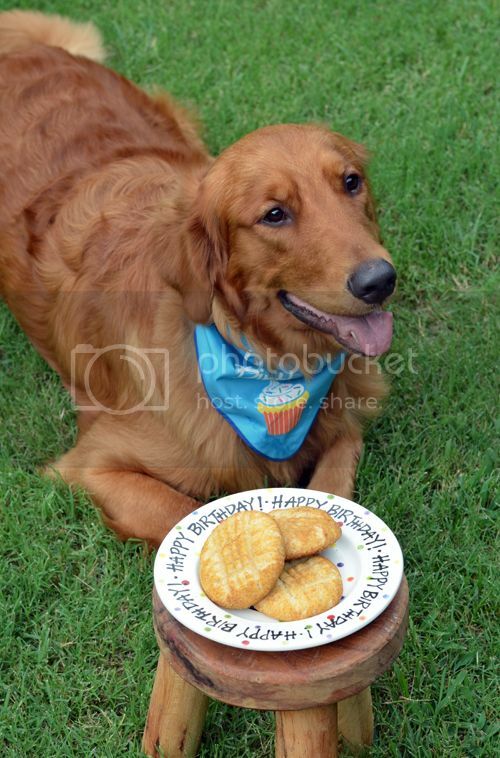 Duke the dog have a great birthday, and your cookies look so delicious! Previous post: I Scream, You Scream, It’s All About the Ice Cream! Next post: Roasted Corn Salsa & Grilling with OXO!